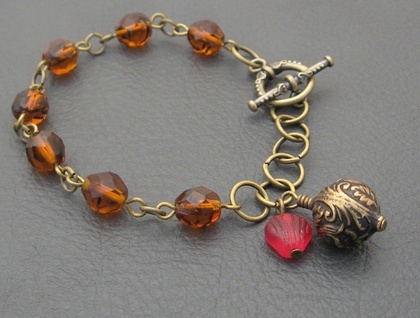 Faceted glass beads in dark amber, with a few darker stripes in them, are linked together in a single strand, and fastened with an ornate, antiqued-brass coloured toggle clasp. 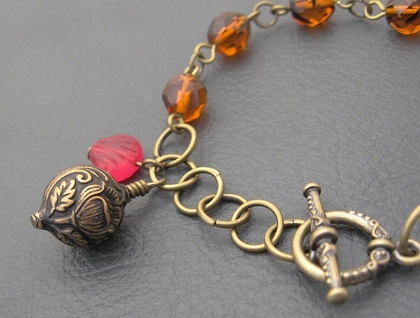 Near the clasp is a short chain consisting of six antiqued-brass coloured rings. 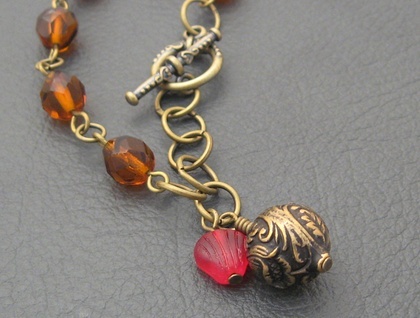 One ring is already adorned with a pair of dangles: a ruby red, shell-shaped glass bead, and an old-fashioned, Victorian-style bead depicting tulips in a flowing, decorative style. The rest of the rings are bare, ready for you to add your own charms, if you so desire. 'Heirloom Tulips' is a one-off Silverlight Jewellery design, never to be repeated. 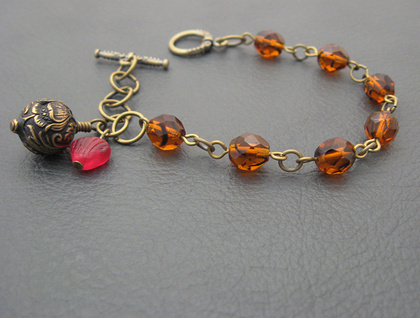 The bracelet measures 18.5 cm, including the clasp, while the tulip bead measures 14mm from top to bottom, not including the wire-wrapping at its top. If you would like this bracelet lengthened or shortened, simply leave a message in the 'notes for silverlight' field when you check out of Felt, stating the length you would like. I can add or subtract rings at no extra charge.